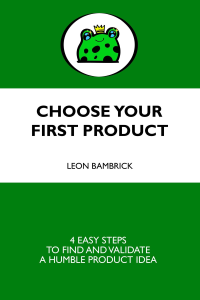 Get "Choose Your First Product"
This charming little tome, "Choose Your First Product," is for any first-time product creator who wants to find a product idea that they can sell with confidence. I've watched people around me as they make their first product. They find an idea they love, or a problem that intrigues them. They pour everything into it. They code in isolation. They delay shipping, again and again as they add features, or polish existing features. If they ever ship, which they almost never do, the product is full of beautiful code. Yet it can't find a single customer. Or very few. And they're supposed to "pivot" at this point. But that's impossible. They're demoralized, for starters, and second, they have no meaningful feedback on which to pivot. They've failed completely. Defeated, they declare "I was just no good at marketing." And give up. They think the problem happened after launch. They didn't hustle hard enough. They didn't choose the right font on their landing page. (Maybe they can A/B their way to success?) They don't realize they were on the wrong track before they even fired up the IDE. This book is a practical remedy to that problem. How do you start with something people will pay for? How do you start with something that will be easy to sell? I've boiled it down to a four-step plan, the T.O.A.D. It's a framework. Of course it is. I walk you through the TOAD, this four-step framework, showing how easy it can be to find an idea that will help real customers. If you want to make a humble product that will help real customers, then it's possible this book will be useful. No pressure though. Stop using passive voice in your writing! Passive voice is when a verb is used without a clear subject. Now that I'm a big kid and I live in the modern futuristic utopia of 2018, I finally understand what passive voice is all about! We've employed a "doing-word", the verb 'used', but we haven't said who or what did the doing. There's no one to blame for this action. "Passive voice is when writers use a verb without a clear subject." Now we know who is doing the thing... writers did the thing! As an editor it's hard to turn someone else's passive writing into active writing. Because when we turn passive writing into active writing we must decide "Who did this verb?" Only the original writer can be sure where to stick the blame. "Passive voice is when writers dribble out their verbs with no clear subject." "Passive voice is when tepid writers lay down their verbs with no clear subject." On this topic of choosing verbs we find another big suggestion from hemingway app: use fewer adverbs. The girl ran quickly across the lawn. Hemingway app will ding you for "quickly" -- as it's an adverb, and Hemingway himself punched out as few of them as possible. You may have observed that he wrote the books "For Whom the Bell Tolls" and "A farewell to arms". He did not write "For Whom the Bell Merrily Tolls" and "A Cheery Farewell to Arms." A writing coach won't just tell you to ditch the adverb: they'll get you to improve the verb. The girl ran across the lawn. The girl dashed across the lawn. A single word, a verb, that contains within it more meaning than the verb plus adverb combo. And again, only the writer, not the editor or the coach, can choose the correct verb. The girl sprinted across the lawn. The girl flew across the lawn. The girl tore across the lawn. The girl fled across the lawn. And so on. Each with different connotations. Summary: a .ok file holds a bunch of handy one-liners, specific to the folder it is in. It can be viewed or executed with a simple command. It makes you smarter and more efficient. I work on lots of little projects and each one has its own nuances and tricks. Context switching from one project to the next is hard on the brain. Some projects are brand new, some are ten years old. Some are in Windows, some are in Linux. Every time I go to resume work on a project there is that moment of confusion as the brain tries to reload a dusty tape of facts from cold storage. If I want to add a command to the file, it is the work of a moment. I can do it immediately by editing the ".ok" file with "ed" or any standard editor. Sometimes I write a thing and slowly stop using it. Other times I use it more and more, day after day, year after year, as happened with NimbleText. So far, "ok" seems to be one of those "use it more and more" solutions. So I think you would do well to give it a try. As a family, you have a huge photo problem. Well, at least my family does. After a holiday we have thousands of photos on two smartphones, two regular cameras, and a few on an iPads as well. From this horrible mess, my wife wants to select the best of the best and print them in a photobook. Before she can start putting the photobook together, we need to collate the photos from all the devices in such a way that photos are in precise chronological order, regardless of which camera they came from. And to make matters worse, the smartphones have automatically adjusted for timezones, while the others have not. Enter the "Rename-Photo" commandlet I put together in Powershell. This thing has improved my life far more than the average PowerShell script. First: if you're going to use this, there is no warranty, and I advise testing on one or two pictures first, before blasting all of your photos. Second: I'm not a great PowerSheller and haven't turned this into a reusable "module". If you want to help me turn it into a module please do! With those caveats out of the way, I'll show you why I love this script and why it brings bliss to my whole family. 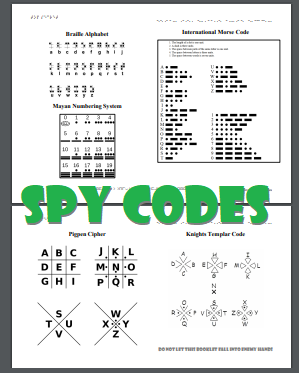 Once you've got those folders in place, you will need to run a script in each folder (more details below). Done that? Now go into one of your photo folders (in PowerShell) and run the rename-photo function against all the files. You'll need to know what values to provide for a few snazzy parameters. 2017-11-10-14-12-10 — is a sortable representation of the date the photo was taken (from the Date taken EXIF data). It's not formatted in strict ISO 8601 format. If the file doesn't have the relevant EXIF data (for example if it's a png file) then the LastWriteTime is used instead. There's one more parameter, and you can use it for fixing the infamous timezone issue. Once you've worked out that the camera's internal clock was reporting times that were 10 hours earlier than the real local time, then add a final parameter of "10", e.g. If you've made a small mistake, the script can be re-run. There's no limit on how many times you can re-name the same file. And you can alter the script to improve the format. And if you change the script, just dot it again. There's no limit on the number of times you can do this either. Once you're happy with the filenames, copy all of the files, from all of the devices, together into a single folder. I tend to break them down into one folder for each year, so you don't totally overwhelm the file system. Then all the files are together, and the joyous hurdy gurdy of a family trip has been sorted into a single stream of captured moments. Any improvements, please submit a pull request or raise an issue on GitHub. Any questions, the comments are open. How do 7-segment LCD displays work? 7-segment LCD displays are the sort you see on old-fashioned digital watches, microwave ovens, time-traveling deloreans and other common household appliances. First I drew 10 sets of the 7 cells, all inactivated. I described to her how the 7 cells are switched on or off to make the numbers. Together we colored in the right cells to make up each digit. We talked about how the digits from 0 to 9 can be described by 7 switches. I drew up a blank truth table and filled out the first row, to show which switches were on or off for the '0' digit. She got it immediately and set about filling out a lot more of it. 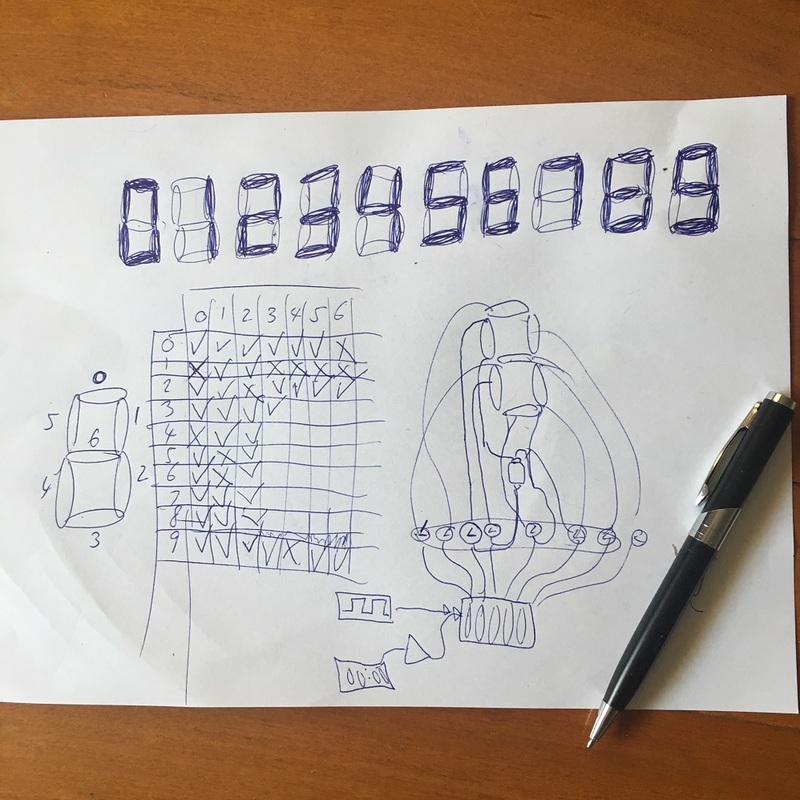 She soon optimized filling out the truth table by doing a single segment at a time across all numbers (rather than getting a single digit done at a time). i.e. she would fill in one column at a time instead of one row at a time. I found that a surprising optimization, and it was definitely a faster way to do it. I described a bit about how you could make a circuit that does this. (She's made simple analog circuits with roominate and snap circuits). I talked about the use of a decoder and an oscillator; I doubt she absorbed much of that... digital circuit design can wait, this was more of a way to spark her own thinking. Later that day I asked the kids what their favorite part of the day was. My youngest replied that her favorite was the bit where we drew the 7 segment displays. I was happily surprised so set about writing this "bragpost". I think it means this is an activity that kids might enjoy more than you'd initially expect. People say "real life" is the thing, but I prefer the command line. I live there all day. It's super helpful when you're navigating around. If you want to move "up" by 3 folders, you just type "...."
In bash you can put an equivalent thing in your profile. For bonus points, don't use cd -- use pushd instead (it works in bash, powershell, even DOS) -- and it means you can return to a previous location with popd. If you set your goals even a little bit too high, then your performance will be considerably worse. I've started using my iPhone to track how many steps I do each day. When I first started tracking my steps, I set the goal at 10,000 steps per day (10K) because that's what I'd heard was good. I'd make it most days but fail on other days. Sometimes I'd smash way past 10k, then crash really low for a day or two. In 3 weeks, I missed my goal on about a quarter of days. It felt quite frustrating. With this lower goal of 8K per day, I've now managed to achieve my goal every day for 42 days, also maintained a much higher weekly average than I had during the 10k days, and I feel a lot better about it. I might increase the goal soon but would only increase it to 8,500. 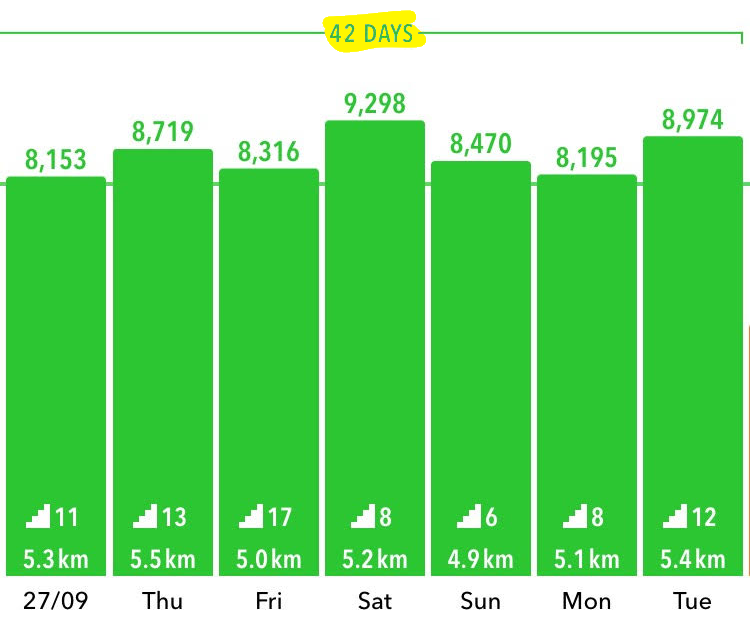 If I manage that consistently I'll bump it up again: but the increases will be slow and steady and always achievable.